CNN — When Chuck and Elicia James ventured to their local animal shelter to adopt a dog, they expected to meet a new member of their family. Instead they found themselves reunited with their long lost canine. The James’ had not seen Reckless, a brown and white terrier-pitbull mix, since he went missing over a year and a half ago during Superstorm Sandy. They had lost their beloved pup after the fence in their Keansburg, New Jersey, home was mangled during the storm, Chuck James told CNN on Friday. 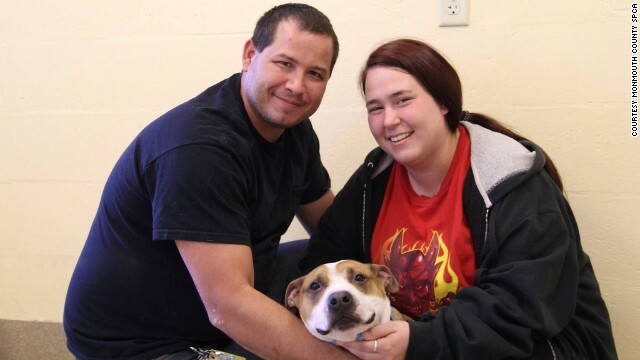 Apps go to the dogsFamily finds dog amid landslide rubbleCancer patient reunites with lost dogWhile the family never stopped looking for Reckless, for their 10-year-old daughter’s birthday they decided it was time to move on and adopt a new dog at the Monmouth County SPCA. Read more: Storm family, dog reunite 18 months later – CNN.com. RICHMOND, British Columbia, Aug. 31 (UPI) — Animal protection officials in British Columbia say someone abandoned 50 dogs outside two shelters. Thirty-eight dogs were found in cages at a shelter in Richmond and a dozen more were left outside one in Westminster, the Richmond News reported. Carol Reichert, executive director of the Richmond Animal Protection Society shelter, said the dogs, mostly smaller dogs such as terriers, Yorkie and Chihuahua crossbreeds, appeared to be in relatively good health. Read more: Mystery person drops off 50 dogs outside 2 animal sheltes in Canada – UPI.com.